The other staff have a practical attitude as well. I was very enlivened to find the piece and wanted to talk of its well-fashioned colors and perspective. The checkout guy looked at the price tag and worried about how to compute the day’s discount. But, I was excited. Because no matter how hard I looked, even with my magnifier glasses in the bright light of the front window, I couldn’t tell if it was an original or a print. Watercolors are the most difficult. They reproduce so true to the original. I was looking forward to taking it back to our studio and dismantling it. Only then could I be sure. Taking it apart revealed thick textured watercolor paper, not the smooth of a print. Letting the light shine through it revealed the varied thicknesses of paint, the only sure determiner of it being an original. This was worth being excited about. I cleaned it up, touched up the frame, added a new backing paper; it looks wonderful. Just a bit of aging on the mat, just enough to let us know this is a vintage piece. This painting holds a wonderful puzzle of history. Ralph Didriksen, the artist, writes on the lower edge of the painting that the Haring House was built around 1797, but the Bergen County histories say it was built in progressive sections beginning in 1755, with additions in 1805, 1808, and again in 1870. The stone portions are the oldest with the kitchen displaying a classic Dutch oven made of stone. It is a favorite of locals and tourists and is listed on the National Register of Historic Houses. Didriksen may have admired the old homestead from his car on the way home from work every day. I get the sense he must have loved the house in that he gives it a more romantic feel and elegance than the actual historical photos reveal. Mr. Didriksen passed away not so long ago. 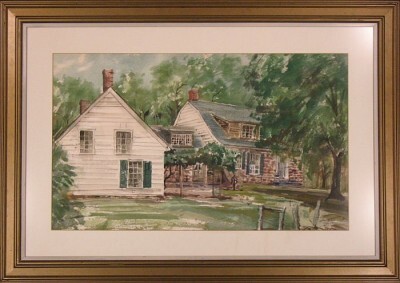 I am happy to have rescued his beautiful watercolor from being forgotten in this plain, hard to remember thrift in western Connecticut. I hope he would be happy as well and proud to be remembered in this beautiful work of art.